Rees Jones, course designer for Pinehurst Resort's #7 Course, explains that working at the 'home' was one of the biggest thrills of his career: "I was so excited about getting a Pinehurst job (this was the early 80's), that when I heard the news, I stayed up all night planning the routing. I saw that the land included some wonderful contours and elevation changes, so I located the holes down in the valleys, and the lots (for the houses) up on the ridges." Well, if Dickens' Ghosts of Christmas Past, Present and Yet-To-Come were able to turn old miserly Ebenezer Scrooge into a philanthropist in one night's turn, then it's certainly understandable how Jones would be enthusiastic enough to sketch out the outlines for Pinehurst Resort's newest layout during the graveyard shift's scheduled hours. The 9th hole presents quite a challenge from the back tee -- carry water, then reach an elevated green. 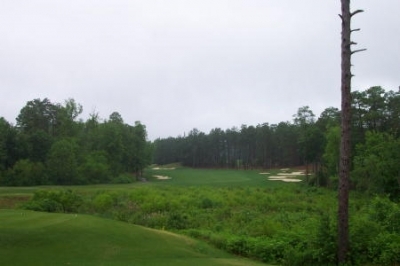 Jones says the original thinking was for the course to provide a championship level alternative for the guests staying at the Resort, most of whom were solely interested in playing the world famous Course #2: "At that time, ClubCorp had just purchased the property, and wanted an alternative course for resort guests to play, to take some playing pressure off of Course #2. They said they wanted a course that would compare favorably in difficulty with the main attraction there, which was pretty hard to do." But the nature of the property allowed Jones some leeway on that question. "It's probably the most rugged piece of ground of all the nine golf courses there, so it already had a lot of automatic drama. I think because I was able to lay out the road patterns (the course weaves through a well set-back housing community) and the golf by myself, I was able to utilize all the natural attributes of the site for golf." Jones admits that they built Course #7 on a relatively modest budget. Perhaps because of it, he was brought back in 2002 to touch up and improve the course. 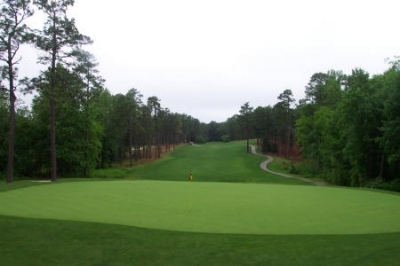 "The Pinehurst folks wanted to put the same G2 Bentgrass on all the greens at the resort, and there were some other issues that had cropped up since the time Course 7 had opened." "And so I brought in my own shaping crew, and we rebuilt all the bunkers, installed square tees in the 'classic' style, redid the fairway bunkers and constructed the greens with the contours that I normally design. Some of the greens had previously been a little too sloped, which wouldn't have been receptive to these newer high-speed, heat tolerant grasses. We had to rebuild the greens for agronomic purposes, too. It was like being granted a mulligan on rebuilding that course." 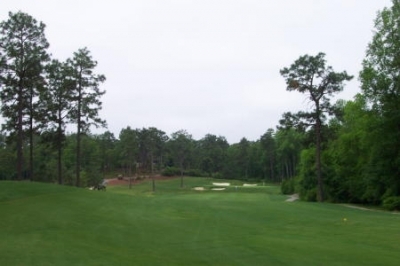 You'll see a few more carries on Course 7 than you will at some of Pinehurst's other courses. Here, the 12th tee. 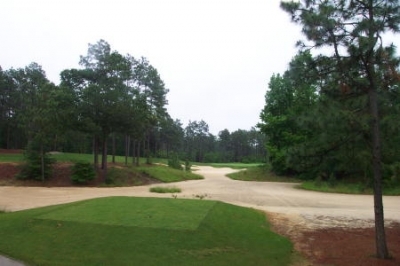 While most of our mulligans usually turn out just as bad (or worse) than the first go-around, that's certainly not the case when talking about Pinehurst #7. Chad Campbell, Director of Golf and Club Operations at Pinehurst Resort, thinks the 'redone' #7 is a big improvement over the prior layout: "I think the aesthetics of the course greatly improved after the re-modeling. The new style of bunkering that we decided to go with leads you down the golf course a little bit easier -- it moves your eyes in the direction that you want to play." "The most important thing was Rees Jones was able to maintain the integrity of the course without changing its character -- which was to keep the challenge from the tee, with an emphasis on putting in a different stroke than what you see at Course #2 and the other courses," Campbell added. Having seen five of them, and heard the reputation of the others, Course 7 seems to play second in difficulty only to its more famous sibling. Campbell acknowledged that it might look that way, initially: "One of the brilliant things that Jones did was make the course more playable for the average resort player, while simultaneously making it more difficult for the low handicappers." That didn't make sense, until Campbell expanded on the notion. Pristine conditions, even for a recently opened course. Here, the 17th green. "Jones added collection areas to a good number of the greens on Course 7. There's good and bad on that -- I think for a higher handicapped player, it's easier than before to get the ball up and down in three from those areas on this course. But for a low handicapper, it's very easy to get short-sided on a green where you don't have a lot of room to work with, and a tight pin, and it's very difficult to get up and down in two," Campbell said. He continues, "But it's still fair for everyone. Jones pulled it off -- pleasing all types of players in the process." 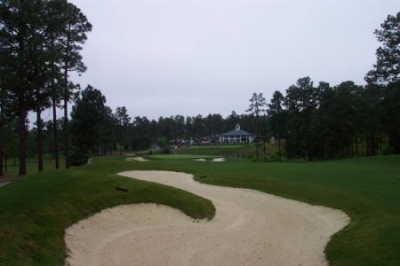 Jones said he purposely didn't mold the course in the traditional, Donald Ross/Pinehurst look with domed, turtle shell greens, but he still tried to incorporate some Ross elements into the layout: "We realized from looking at the land that we couldn't really do the crowned greens on Course 7, like they have on all the other courses at Pinehurst. Crowned greens aren't suitable to receive uphill shots, the type of which you'll see quite a lot on Course 7." The 8th hole is a 543 yard par five, with a steep dogleg right. If you carry it close enough to the leg, it might be reachable in two. "When we did the renovation, we tried to put in some Ross-type elements -- so it's a Rees Jones golf course with a Ross flare. For example, we put in all the chipping areas, that would perhaps be reminiscent of Ross's style, but we also created some chocolate drop mounding on some of the holes," Jones said. Chocolate drops? Hershey's Kisses at Pinehurst? Jones elaborates: "In the days when Ross was building golf courses, they often put them on open ground with no trees -- basically open farmland, which presented the dilemma of where to put the rocks they'd dig up during construction. As a result, he placed them on the sides of the fairways and buried them -- essentially creating the mounds." From the tee box of the world famous 16th hole. The 'fingers' are in the distance. "I'm a member at Montclair Golf Club (near Jones' home in New Jersey), and it's a Ross course, with the mounds in between the fairways. So we put those mounds in between the 2nd and 6th fairways (which are adjacent), and also to the left of the 8th hole, as a tribute to Ross's style." That's not the only honorarium Jones dedicated to the legendary Scotsman on Course 7. In back of the championship tee on the 4th hole, there's a bunker. Realizing there are an awful lot of horrible golfers in this world, it's conceivable you could place a bunker just about anywhere, and somehow it might come into play. But in back of the back tee? That's stretching it a bit. Until Jones shared the reason for it: "During construction, we found some bunkers near what today is the 4th tee on Course 7. The big question was whether the bunker, which was part of a green complex, was part of one of the original designs for Course 2. It's well known that Ross changed the routing several times for Course 2, and this particular hole could've been part of that, or possibly part of an employee's golf course that existed at one time in the area." That's a relief. You'd have to hit a Phil Mickelson 'backwards' shot to reach that thing, off the tee, so all contingencies weren't necessarily being covered on the course -- instead, it's a nice tribute to the man who's largely responsible for Pinehurst's lofty reputation as the 'Home of Golf' -- Donald Ross. Avoid the bunkers on the 18th hole, and you might have a shot at getting a stroke back on this par five. Another tribute, perhaps, is a reasonably player friendly golf course. Ross loved to challenge players, but not with trickery, gimmicks or hidden hazards. The same philosophy holds true on a Rees Jones designed golf course. Campbell says there are several ways players will enjoy Course 7, starting with your very first decision of the round -- which tees to play from. "We have five sets of tees, ranging from 5183 to 7216 yards. For women, we've got two sets of tees, and four sets for men." But that's not all. "The fact that we have the collection areas, which keeps an errant shot from really getting away from the actual playing ground is very beneficial. It used to be you'd see a lot of chips from a downhill lie to a downhill green, and it took quite a golf shot to get it close -- and many times, it took quite a golf shot to even stay in play," Campbell said. Finally, in the Rees Jones tradition, you'll see what you need to do on nearly every shot. Again, Campbell expounds: "Because the layout is sitting right in front of you, there are very few places on the golf course that will come as a complete surprise." The view from the 7th tee. Intimidation, all the way. "Usually when you say that, you're looking at an easy test of golf, but this is a very challenging golf course. I don't think the player's going to score as well as they would hope on this course, but they're not going to walk away at the end saying 'man, that thing just beat me up, and it's so unfair,' because it's an extremely fair golf course." Though it's nearly impossible to pick highlights from a course of this quality, we particularly enjoyed the 7th hole, a 394 yard par four, appropriately named 'Devil's Gut.' From the tee, you'll notice the hole is fairly short and narrow, so you'll be able to club down in order to leave yourself a short iron into the green -- avoiding trouble literally on all sides. The added bunkers in back of the green make it quite an attractive site. On the back, the 16th hole, named 'Jones' Fingers' is one you'll not likely forget. Campbell describes it: "The great thing about the 16th hole, is it's got all those unique shapes (the 'fingers,' which appear hand-like in a large waste area), yet it's still very natural looking. The green has a large contour in the middle that makes it difficult, even with middle or short irons, to hit it close -- because you have to play for the rolls you're going to get on the green. It's a well designed hole, and very fun to play." That's the overall impression you'll take from playing Pinehurst #7. 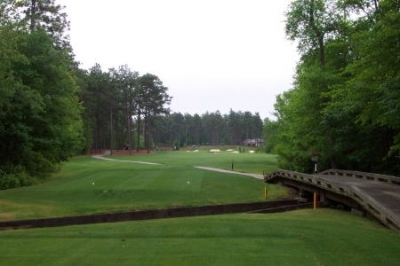 It's different than the other Pinehurst Resort courses, yet will still give you the same type of quality and feel that the entire resort represents. Which just goes to show, working at 'home' can be prestigious after all -- especially when that 'home' is located in Pinehurst, North Carolina. 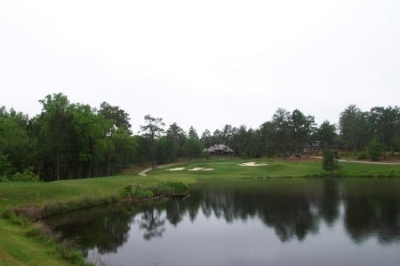 Pinehurst Resort is owned and operated by Clubcorp. We strongly recommend that you consult the website and/or call the above number for package prices and availability, since you'll receive significant discounts over individual daily rates.